Coral Kingdom Of Thras ~ 25 IM Lagoon ~ New Fish!! Thanks! Wanted to go all out with this one from the start. I think I have everything I will want or need at the moment. I just hope the nanobox duo will be good enough lighting for SPS. I have been reading mixed reviews on if it will be adequate or not. The duo will be more than enough for the IM lagoon. You gonna love the color spectrum and so will the corals. Been setting up the Apex for what seems like all day. This thing is so finicky. Always disconnecting, seems like half the stuff isn't working right. Trying to calibrate probes, keep getting errors. I am not not sure if this is all do to using the Apex Fusion app on my phone or what. I feel like having the little display plugged into might be way easier to use, which shouldn't be the case. Very frustrating. ACJR was the easiest thing ever to use back in the day. It's Wet! Still pretty hazy after about 7 hours. I'll get some better photos tomorrow once the dust settles. 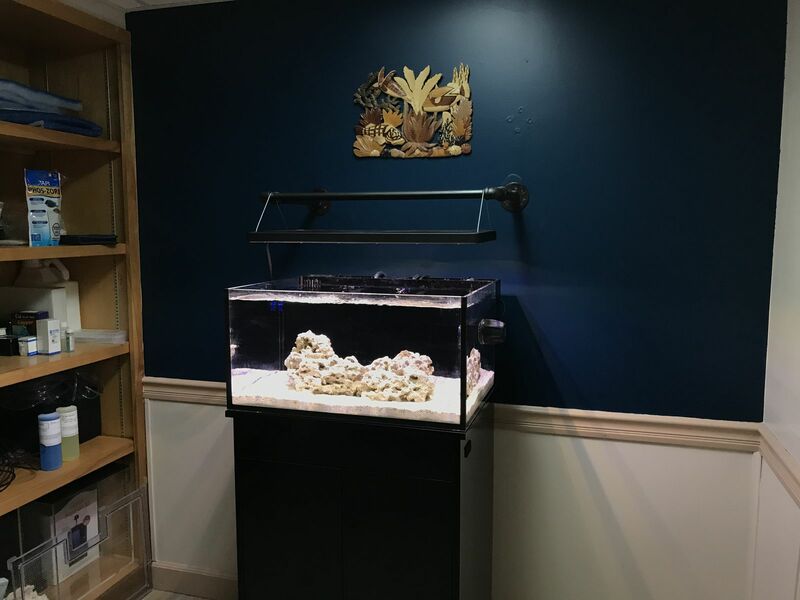 I used about 18lbs of BRS reefsaver rock and about 25lbs of sand. 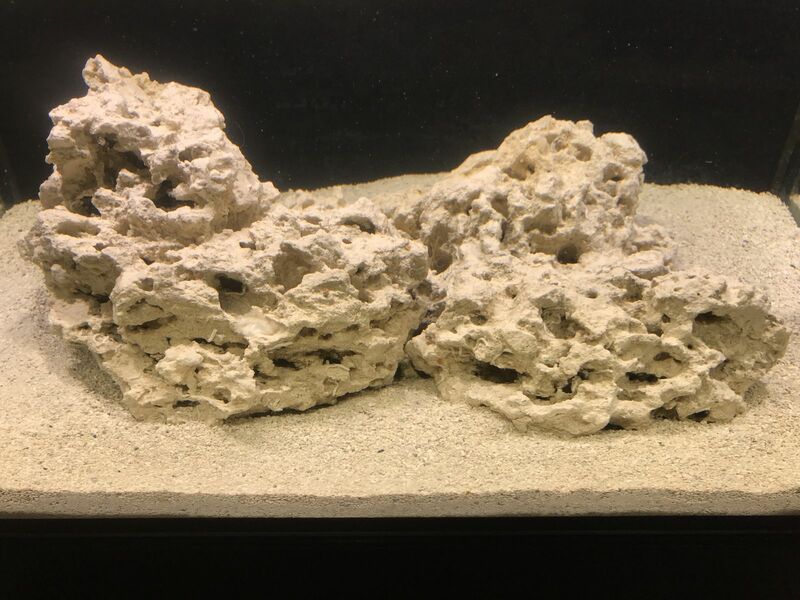 Might have made my sand bed a little too thick, but I am pleased with the aquascape and layout. Only used 3 rocks. I was very pleased with the sizes BRS sent. Finally installed my skimmer. Tunze 9001. I siliconed a small magnet to the side of it. I bought a bigger magnet though, as this one is too small and doesn't secure the skimmer as strongly as I would like. Also, I swear it didn't come with an a ball valve like I see in the photos unless I misplaced it. I ordered one of those as well and longer tubing to hide the little air cup thing. Here is a shot of my aquascape as well. The tank has cleared up quite well. My light should be here this week. I thought the BRS rock would have some die off on it to cycle my tank, but my all of my numbers have been 0, so I am going to add a shrimp tonight from the grocery store. I need to bust out the Canon camera and see how the quality looks with that compared to the iPhone 7+. It sucked years ago with my first tank not having a quality camera to share dencent photos. I also need to research into buying a decent macro lens for when I start stocking the tank. If anybody has any recommendations for a macro lens that won't bust the bank, let me me know please. I have a Canon T5i. Was not planning on running any media until the cycle was over, but dang that ? is starting to stink already. I guess I will throw in the chemipure and purigen in now or buy some activated carbon to use, as its way cheaper than chemipure, and use that. Legend says you have to say his name three times while drinking a beer for him to appear. Haha! He asked on my old thread to see the new tank, told him I would tag him. Well the shrimp smell is gone. Now getting the ammonia aroma. I'll test the water tonight and see what my numbers are at. Got the Apex display unit. It worked for about 20 seconds and then just starts blinking faint orange at me. This damn apex is a thorn in my side. Finally got the display working. Just need to wait a few more days before I try to recalibrate the salinity probe. Apparently your suppose to let it soak a week. ORP is crazy low too. I know that ORP numbers don't mean much, but I wouldn't mind mine being in the 300-450 range that seem to be the consensus "good" range. PH probe needs calibrated as well. Not sure why I haven't done that one yet. I think spending hours trying to calibrate the salinity probe made me put it off for now. ? If it was the BRS reef saver rock, it's pretty clean and probably would've had no die off. That it was. Yeah, it's super clean rock. Waiting for this shrimp to up the ammonia. Still sitting at zero. Sounds like it's time to twiddle your thumbs for a while! I went ahead and ordered a C02 scrubber today from BRS. My PH is pretty stable at 7.75 and I know as long as it's stable that the number doesn't mean much but I want to try to get it over 8. Our house here in Arizona is completely closed up with 5 people and a dog taking up all the oxygen. ? I dont have any any way to run the skimmer line outside, so I want to give this a try. It's cheap and I should have plenty of room in my stand for it. I'll update my numbers once I get it next week and have it running. Great start. What fish and corals are you planning? Following. I want to have an SPS dominant tank. I don't think I am going to do any softies. I want to get some LPS but I am not sure how well that will go with high flow for the sps. 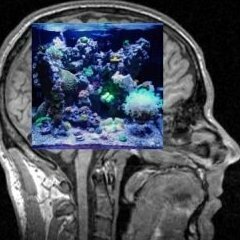 My gut is telling me to stick with SPS and SPS only, as my last tank was a mixed reef and none of the corals were doing great trying to find that balance. As far as fish, I would like these four but I am not sure it's smart to have more than 2-3 for the sps dominant tank. Recieved my light today but came with the wrong color lid. Wasn't sure how to post photos in the Mail, but here is my reciept and the Nanobox. I am hoping you can just send me the purple lid?